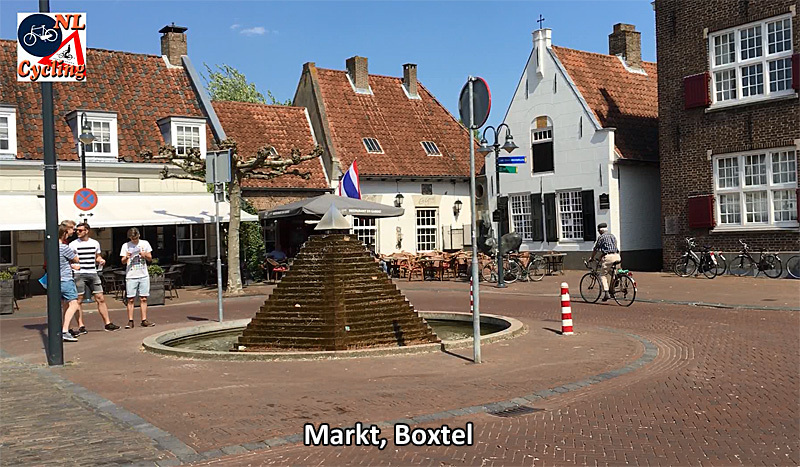 The Markt of the town of Boxtel is the starting point of my 4th ride from Market to Market. From that market square of Boxtel it is a 12.3 km ride to the Markt in ʼs-Hertogenbosch in an almost straight line to the north. Boxtel is a historic town dating back to the 11th century. Today it is home to 26,550 people. Boxtel could be known for the Battle of Boxtel, the first battle of the future Duke of Wellington, in 1794. ʼs-Hertogenbosch and Boxtel were first connected by a paved road when in 1741 the road from ʼs-Hertogenbosch to Liège was opened. This road stayed important to this date and has evolved into the A2 motorway. Most of the route runs parallel to this motorway on a rural, traffic calmed road. The market square of Boxtel is traffic calmed but not car-free. Some other streets in the town’s centre are car-free shopping streets. The largest building on the far right is town hall. The town centre of Boxtel is a 30km/h (18mph) zone. In that zone the space is shared between motor traffic and cycling. 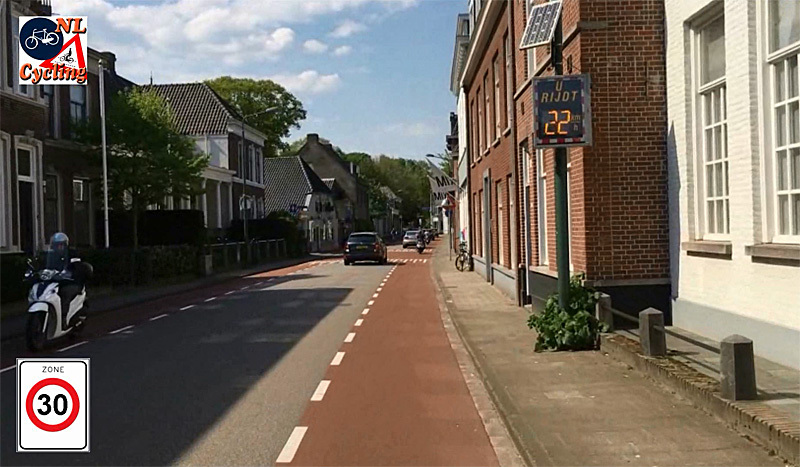 Where the speed limit is 50km/h (31mph) the town has on-street cycle lanes. Where there is more motor traffic, such as on this street, there are separate cycleways. This one is one-directional (there is an identical path on the other side of the street) and has a surface of smooth red asphalt. A bit further on the same street the protected cycleway becomes an on-street cycle lane. The solid line means motor traffic is never allowed on that cycleway. Fortunately this stretch is not too long; from that house in the distance a bi-directional cycleway starts. When you are further away from Boxtel the bi-directional cycle way comes to an end and the road becomes a 60km/h (37mph) road. The lines do not indicate an on-street cycle lane, because there are no bicycle symbols. These lines are only there to optically narrow the road and to decrease the speed of motor traffic. To the right you can see the A2 motorway. These pinch points are meant to further decrease the speed of motor traffic. The speed bumps in the middle of the road can be bypassed if you cycle around the outside. 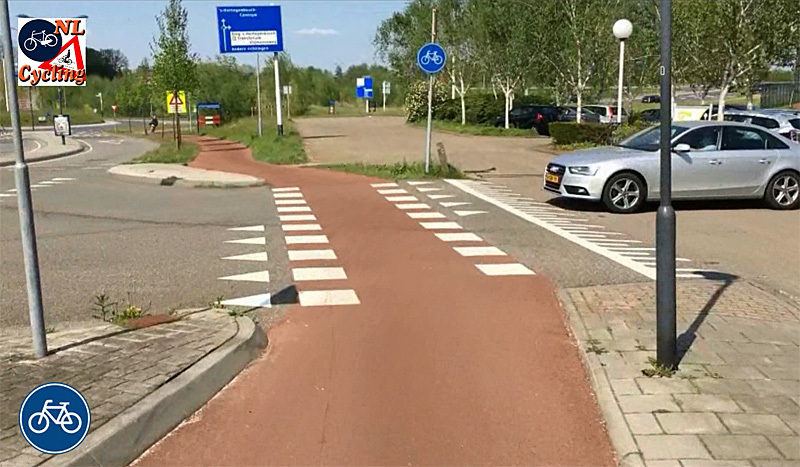 This gives the impression the stripes would indicate a cycle lane, but legally that is not the case. After you entered the built-up area of Vught the speed limit drops to 50km/h (31mph). The road layout is still the same. The outer zone is now in red asphalt, but it still isn’t an on-street cycle lane. That the oncoming people are cycling on the gray part of the road is perfectly fine. This intersection in Vught was the most unpleasant part of the entire ride. I only had to wait 12 seconds for a gap in motor traffic but just seeing all those cars from many directions and trying to judge when it was fine to cross is unpleasant. This 30km/h (18.6mph) zone in the town centre of Vught is not very well observed by motorists. The moped riders also went too fast. The digital sign indicates 43km/h (27.7mph) for the last car. Which is 13km (8.1m) over the speed limit. I cycled 22km/h (13.7mph) in this street. 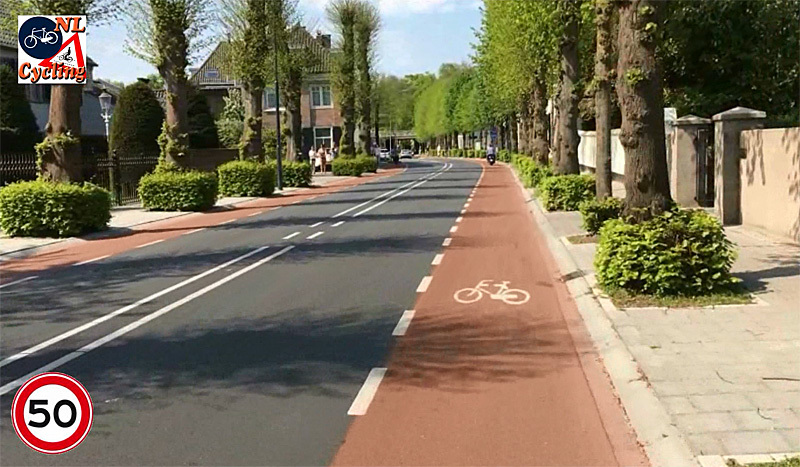 This street (Taalstraat in Vught) was recently reconstructed. 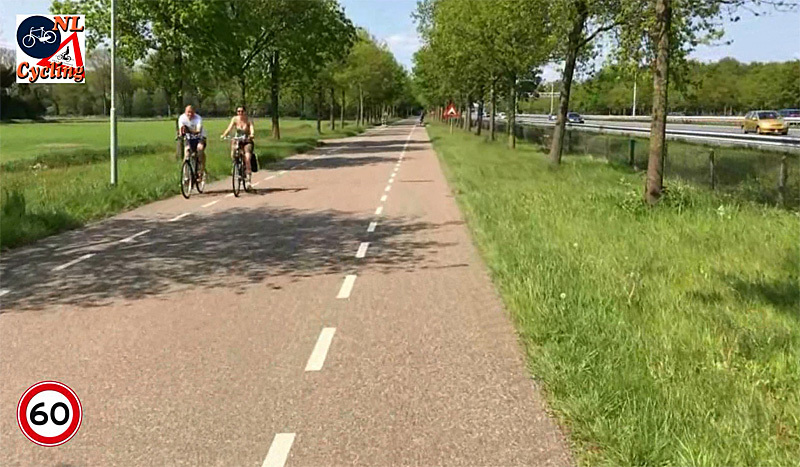 The municipality of Vught was willing to build protected cycleways here, but the residents did not want the trees to be removed. That meant the only option was these on-street cycle lanes. Where the tree line ends a protected cycleway starts. A commercial driveway (entrance to a hotel parking lot) in Vught. The cycleway -bending out here- has priority, which is given nicely by this driver. 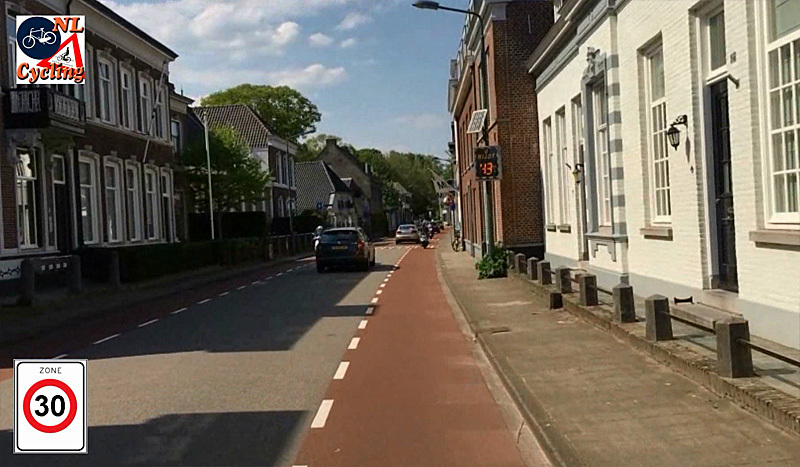 The signal on this service street in ʼs-Hertogenbosch has a small light attached for cycling, which is always green! 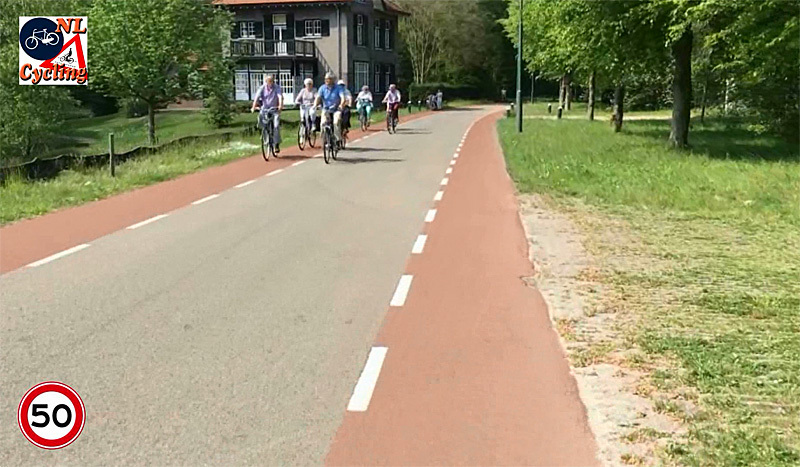 This is possible because cycling straight-on can be done without any interaction with other traffic. The longest stop in the ride was at this intersection at the edge of the city centre of ʼs-Hertogenbosch. Because a bus approached all other traffic was stopped. That meant I had to wait for 20 seconds, which is a bit longer than usual. 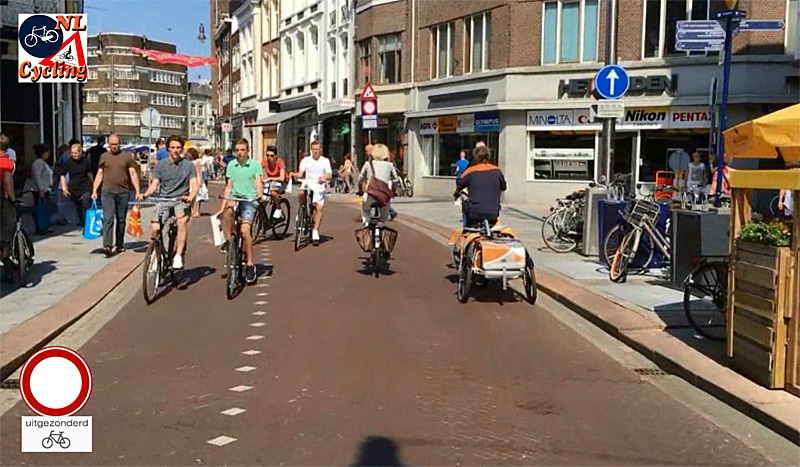 It was very busy with people – walking and cycling – in the car-free city centre of ʼs-Hertogenbosch on the saturday afternoon when this ride was filmed. This street can be used by drivers with a handicap, to reach a special parking place. It can also be used by buses, but other private motor traffic is not allowed here. The end-destination: Markt in ʼs-Hertogenbosch. Balloons are brought into city hall for a wedding. People push their bikes because you are allowed to cycle here, but not on a market day. The 12.3 km ride from Boxtel to ʼs-Hertogenbosch is very direct. Map from the route planner of the Cyclists’ Union. The ride, partly sped-up, in 10 minutes in total. The full ride in real-time (37 minutes). In the speeded-up video, you enter a street with a contra-flow lane at 8.50. Along this street at regular intervals are some sort of black mark or logo on the tarmac. It resembles a picture of a bicycle saddle. What do these marks mean? Wow. Some of that infrastructure would be at home in Australia, however there would be 10-20 times more cars zipping by at 60 km/h, the bike area would be black and you’d barely be afforded the minimum 1m passing distance. In fact there would be more places where the white line is worn away from people driving on it. Why are the conditions in Vught so hostile when it is so close to s-Hertogenbosch? 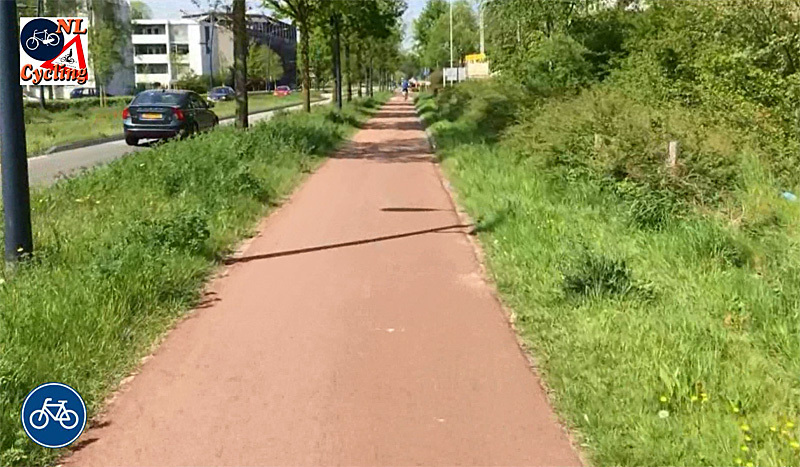 Some of this especially at the beginning seems to be not up to the standard I’d come to expect from Dutch infrastructure by now. 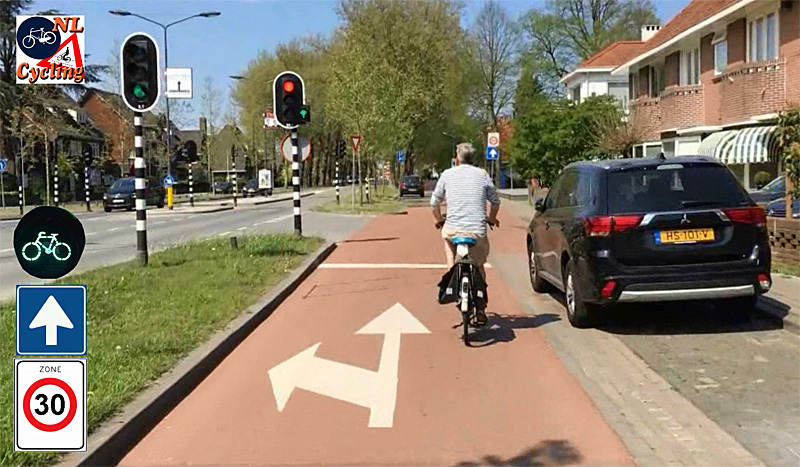 The first roundabout where the cycle track runs directly parallel to the car track as you almost running into a car blocking your way. The second roundabout is much better in this regard. The on-street-cycle-lanes appear to be on streets, where they shouldn’t be, i.e. where you have higher speeds. At one point there even is a bike-box. I had hoped these would have been phased out already, or are they getting a comback? The “fake” bike lanes on the rural roads are a bit in violation of Sustainable Safety’s Predictability principle in that they create a false sense of being bike lanes although they aren’t. The pinch points stress this possible misunderstanding (but it’s good that they are there. 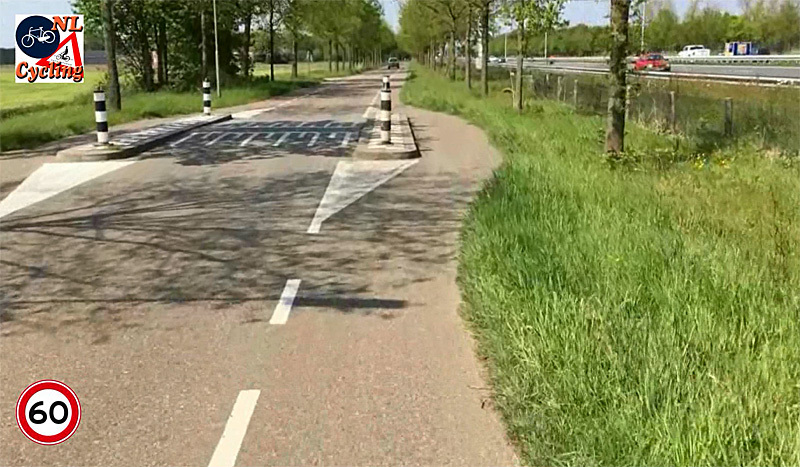 In Germany the pinch points would not have an extra track for cyclists, because planners and many bike advocates here believe this to be safer. 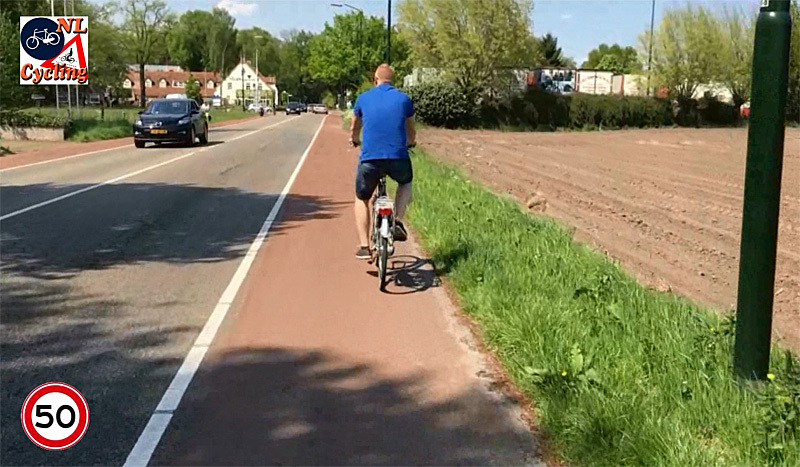 Also here in Germany the state tries to copy these fake rural bike lanes and install them as a standard solution where supposedly there is “no room” for separated tracks. There is a country-wide model project to evaluate this in action ATM. Unlike in Netherlands there seems to be no effort to traffic-calm these roads. In your video, the section next to A2 doesn’t have much traffic anymore, probably because it is next to the A2, so the fake lanes don’t do much harm. Thankfully there is still much to love about the rest of your nice video. I haven’t yet been to Den Bosch or Boxtel, but I do wonder if the smaller nature of the latter is one significant reason why the infrastructure is not always up to the standards. Currently, I live in the small town of Yerseke (~6000 people) in the rural province of Zeeland. Being a very small town, there is almost no bicycle-specific infrastructure within, and some of the busier streets have what’s shown in the 6th photo with the dashed red paths on either side. While the cycling experience here is already much better than anything I’ve ever seen in the US, it’s only decent and not fantastic. The main reason is that a considerable proportion of the drivers here (both with the cars and scooters) drive way too fast. People often do 50 kph or more even down the very narrow city streets that are one-way for cars, speed quickly around tight corners and through intersections that have very limited visibility. Others will accelerate very rapidly once the coast is clear. It was very surprising and completely unexpected to me that so many drivers would behave this way. I had thought that with the small town environment, everything would be slower and very laid back (which the people are, but just not with the driving). My Dutch colleagues who come from other larger cities all feel that the drivers here behave much worst and more recklessly then back home. But I will still say that the experience is pretty good, overall, because the drivers here are used to cyclists and there aren’t really any problems with road rage, etc. People do yield when they are supposed to and you can ride side by side down any street and if that causes motorists to have to wait to pass, they do that without issue. 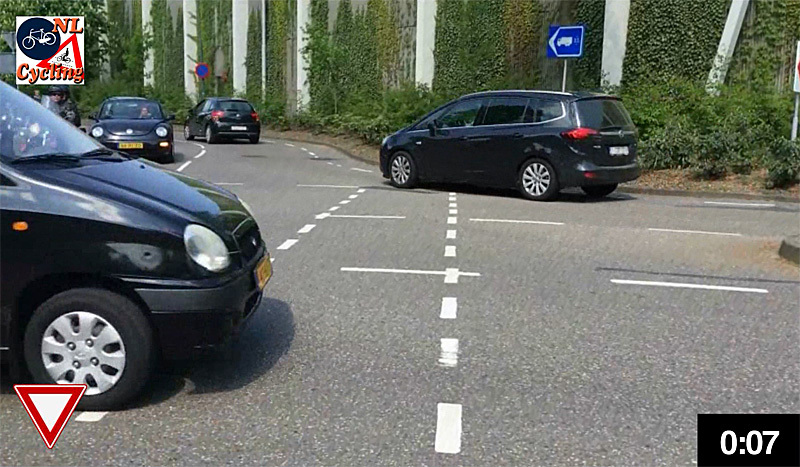 Holding motorists up by doing that in the US will usually result in very angry behavior, for instance. But so this system relies entirely on, and only works because of good behavior. If the motorists here were to be impatient and rude, then the cycling experience could turn quite bad very quickly. I don’t know if conditions for cycling have changed in any way over the years in Yerseke. 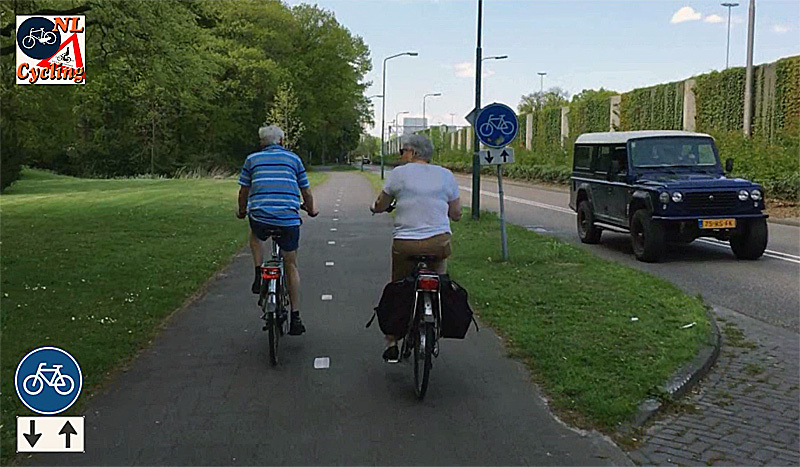 In the meantime, cycling is still very normal and you see people of all ages doing it just like what one would expect in the rest of the country. 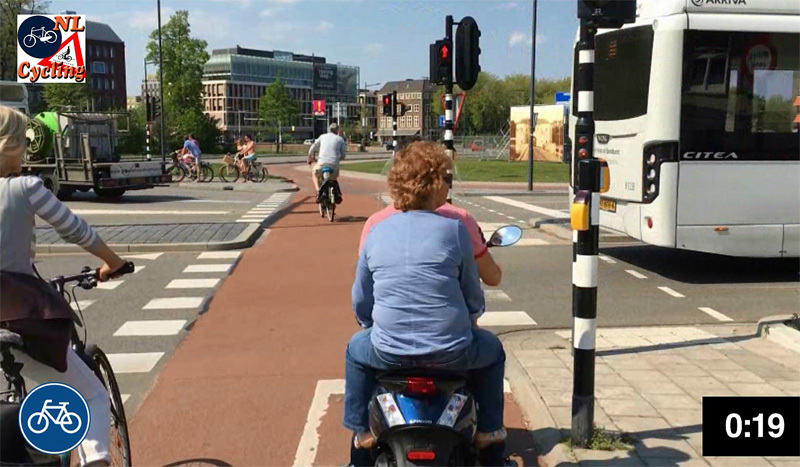 I share the small-town experience you describe: I live in Rotterdam and people over here seem more relaxed about sharing the road (there is, of course, more space to do so), but whenever I drive a big bus through small towns pedestrians and cyclists seem to be surprised when I yield to them. Most of the drivers in those areas live there, so it’s funny they’re not taking more care. The Dutch love their bicycles so much that while looking up good practice songs (children’s songs tend to be useful because they tend to be simpler and presenting simpler plotlines. Unfortunately, children tend to sing faster), I found a song called Zwarte Piet ging uit fietsen. Black Peter riding a bicycle. Almost funny about what the Dutch will sing about sometimes. Almost. Perfect. Such a nice day to be out cycling! Would I be right in suspecting that the route you took, part of it at least from Vught to Den Bosch is part of your routine to swim? The historic petrol station, the roundabout, that traffic light junction in Vught and the Heetmanplein made me think so. I actually read some of the SWOV documents and found that originally, when lower limits were proposed for rural areas as part of sustainable safety, the original pitch was 40 km/h zones, not 60. I wonder what you think of that idea? And also, rural distributor roads were proposed to have a 70 km/h speed limit, as head on crashes are still possible if the barrier between the direction is just paint or raised ridges but if you put a raised median with kerbs (but no crash barrier) between the two directions, even if safe for 80, then drivers have a harder time understanding what kind of road it is. And to the residents who opposed that cycle path on the grounds of tree removal, I suggest that you know that those trees are still trees, they will grow to large at some point, and thus removal is required. Why not try to transplant them in a park while you still can, hopefully saving at least some, and put fresh trees that will last longer in their place? 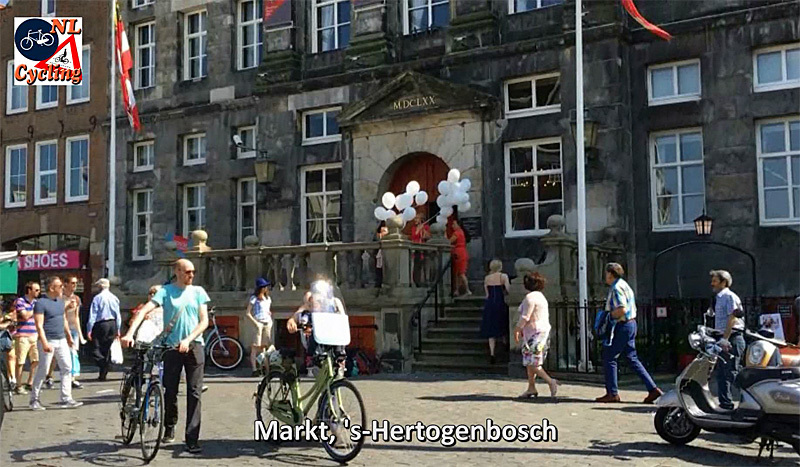 This entry was posted on 7 June 2016 by Bicycle Dutch in Original posts and tagged ’s-Hertogenbosch (Den Bosch), Boxtel, market to market, ride.